Enjoy traditional home-cooked meals over 100 years old that gave visitors a great experience . 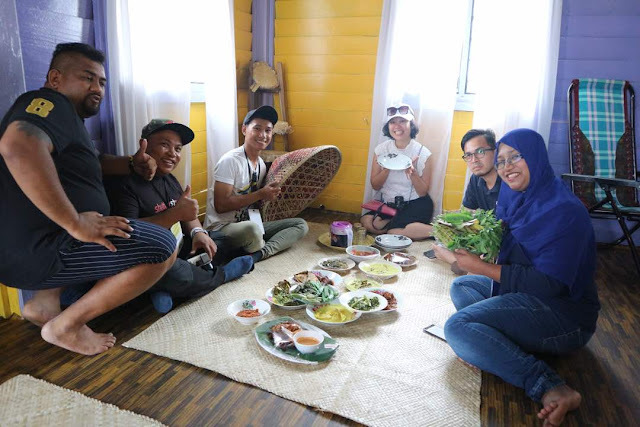 Sri Muallim restaurant located at Tanjong Malim and has created a twist , not only because of its antique home décor but also serves the village cuisine . Manage by Mohd Rizal Amir and his wife Rozana Habizar , the two-storey house formerly known as Bangunan Sri Perak . This built-in house design features without the nails , instead using punching and solving methods to assemble the board or wood on the house . Windows, ridge, ladder and lattice and ceiling still retain the original build. Most the patrons like to come and enjoy their meals at here because for them this atmosphere reminded their hometown wooden home by their . The interior of the house especially the top is made of the wood turn out will feel more comfortable even in hot weather even the air come in well . The Balcony area is always the choice of customers by enjoying a cup of coffee while chit chating . using classic patterns of curtains on Windows makes the atmosphere of a wooden house in the village . Rizal and Rozana promote Tampi rice set , which is a traditional dish that was dine by the Malays for decades . This Tampi rice dish has three main menu and customers can choose whether to taste fish head curry , mutton curry or sour spicy mutton with fried chicken and salty eggs . The chilli Paste is also a recipe from hereditary, raw vegetables with sambal belacan chilli Paste and budu and fried tempe . Dessert will be boiled potato or boiled banana with grated coconut . The drink , which is specially made from lemongrass . The restaurant is able to accommodate up to 200 people at a time . Visitors can choose whether to eat cross-legged in or sit outside in the provided space . At Sri Muallim , they also offers catering services . contact Sri Muallim Restaurant for any inquiries .